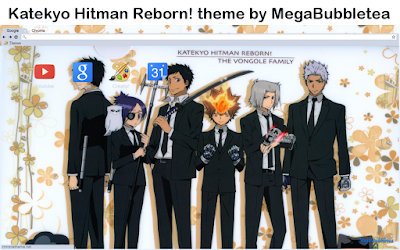 Chrome Theme: Katekyo Hitman Reborn! Well hello guys, it's been a while since my last Chrome theme but I have found some time recently to quickly throw something together. The Katekyo Hitman Reborn! theme was a request some some guy (I've forgotten) to my email. Well shout out to that guy: thanks for waiting. Here is your theme. Enjoy!